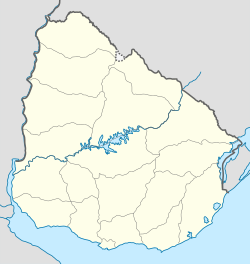 The 1995 Copa América football tournament was staged in Uruguay. It was won by Uruguay, who beat Brazil 5–3 in the penalty shootout after a 1–1 draw in the final. All 10 CONMEBOL members took part, with Mexico and the USA invited in order to reach 12 teams. The USA were the surprise of the tournament, beating defending champions Argentina 3–0 and winning the group. The USA went on to defeat Mexico on penalties in the second round but then lost to Brazil 1–0 in the semi-finals. They then fell to Colombia 4–1 in the third-place game, finishing fourth overall. In this edition of the tournament, extra time was not played if a match was drawn after 90 minutes. Instead it went straight to a penalty shootout. The teams were divided into three groups of four teams each. With four goals, Gabriel Batistuta and Luis García both ended the tournament as top scorers. In total, 69 goals were scored by 45 different players, with three of them credited as own goals. ^ Straus, Brian (2016-05-25). "Copa America semifinals: Personal memories of USA's 1995 run". Si.com. Retrieved 2016-06-21. ^ Kristan Heneage. "The day USA beat Argentina in Copa América: 'Simeone threatened to kill us' | Football". The Guardian. Retrieved 2016-06-01. ^ "Revisiting the USA's fourth-placed 1995 Copa America finish". Goal.com. 2015-07-26. Retrieved 2015-08-01. ^ "Podcast: USA's Alexi Lalas, Eric Wynalda recall 1995 Copa America – Planet Futbol". SI.com. 2015-06-26. Retrieved 2015-08-01.